After handling hundreds of cases, we have learned that a bike crash is rarely a "bike accident." As a Tennessee bike crash attorney, Amy knows the difference. Amy has represented cyclists in Chattanooga, Knoxville, Memphis, Nashville, and from all across the state. Bike accident attorney Amy Benner has been riding a bike as a triathlete and a commuter since 2005. After experiencing cyclist infrastructure elsewhere, Amy made it her goal to see these same options available in Tennessee. Along the way, Amy realized she is in a position to fight for cyclists and their family members who have been injured or lost loved ones as a result of unsafe road conditions or negligent and hostile drivers. Amy lives, works and plays in Knoxville, but can be found practicing law throughout the state of Tennessee. 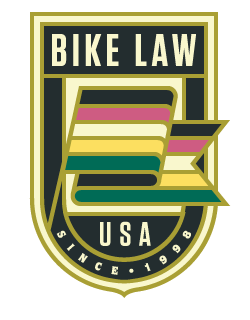 In March of 2014, Amy attended the League of American Cyclists’ National Bike Summit in Washington, D.C., where she met Peter Wilborn, and was inspired by the Bike Law mission of client and cause advocacy. Amy is affiliated with Bike Walk Tennessee, and speaks at Bike Walk Tennessee’s annual summit, which rotates throughout the state each year. She is headquartered in Knoxville, and represents bicyclists in Memphis, Nashville, Chattanooga, and everywhere in between. Read Amy's analysis of the rights and duties of cyclists in Tennessee: Tennessee Bicycle Laws. Amy employs a private investigator, an accident reconstructionist who specializes in bicycle accidents, and a bilingual receptionist to meet the needs of her clients. Additionally, Amy has developed a positive working relationship with law enforcement officials, whom she can reach out to when a new incident occurs. If you or a family member have been injured in a cycling accident, and you wish to discuss your legal options with Amy, email her at [email protected] or call her at 844-531-7530.